Happy New Year, all. 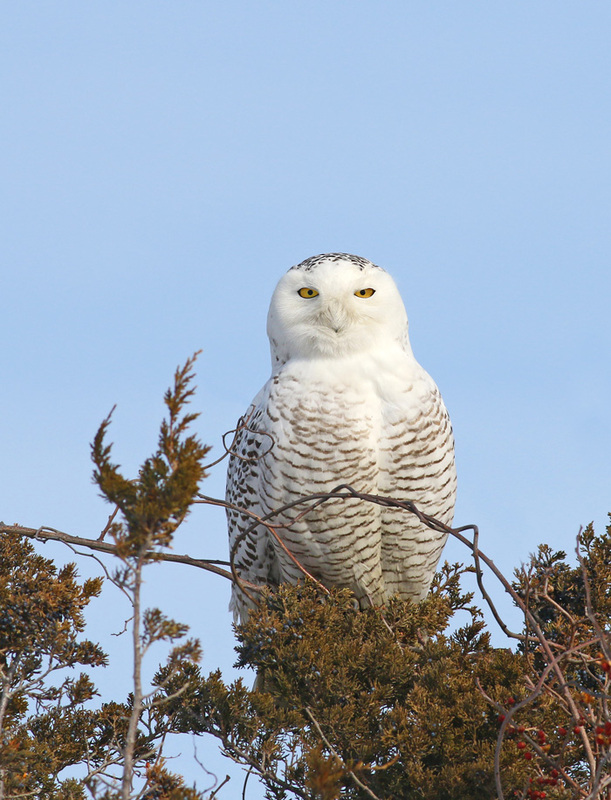 Yesterday morning I finally had a chance to look for local SNOWY OWLS...probably the last birder in the state to do so, as this winter's significant southward movement of this species hit the region a full month ago. 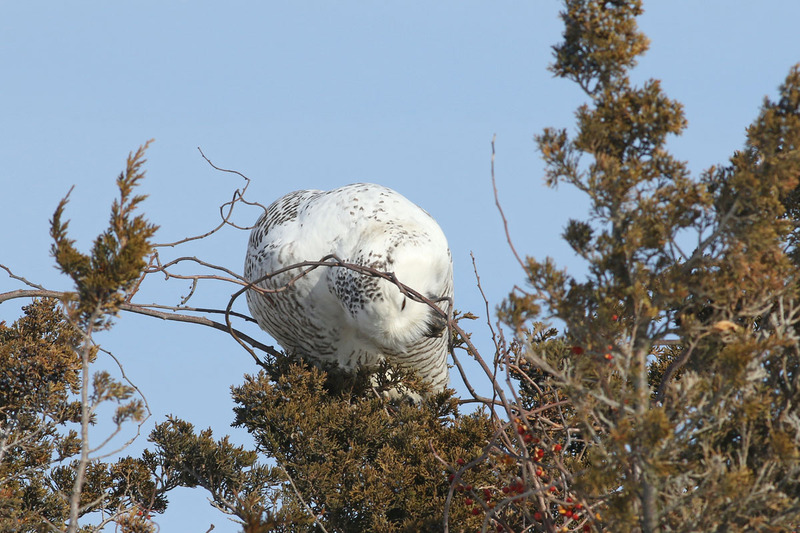 Sightings have been consistent since then, so apparently several birds have settled into prime locations for the winter. 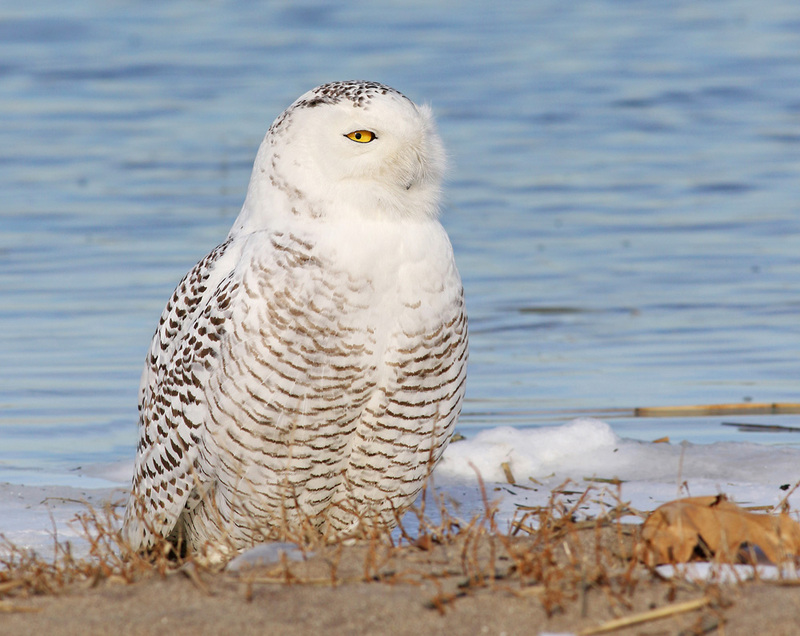 One of these locations is Long Beach in Stratford, CT, which is consistently a top spot to find Snowy Owls in the state. 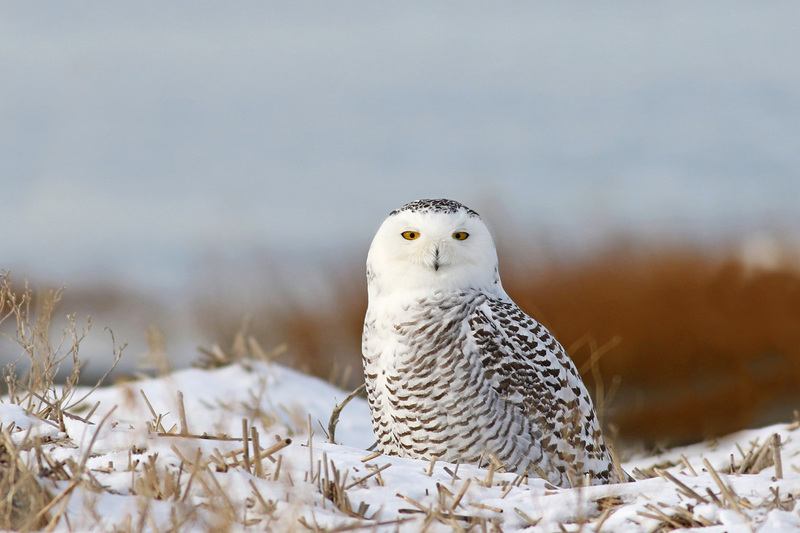 The adjacent saltmarsh & vicinity likely holds enough food to support multiple owls, whether they're after rodents or waterfowl. It didn't take long to spot two of them (there have been 3-4 individuals reported here recently) - dark young females roosting in the marsh separated by fifty yards or so. 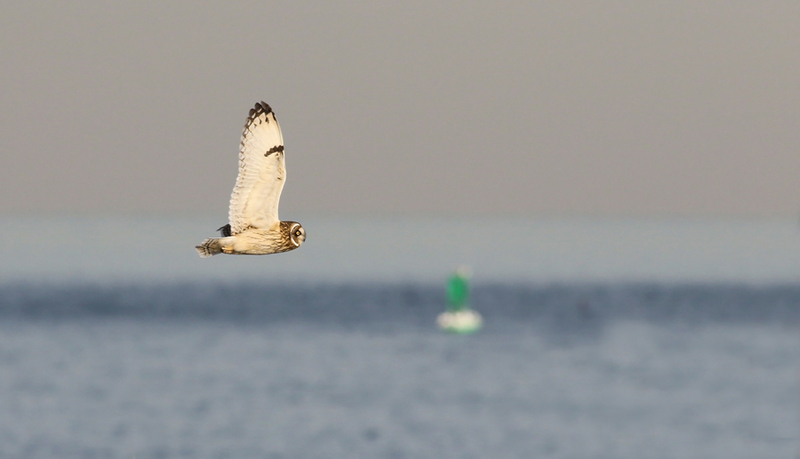 That was a bit too close for one of the owls, which decided to chase the other one off. 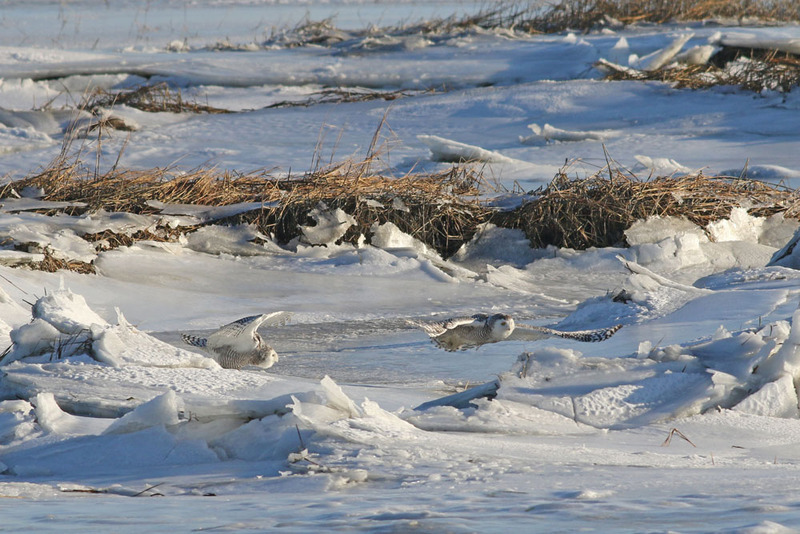 Both birds eventually settled separately in the marsh and did not seem in a hurry to move anywhere for a while. 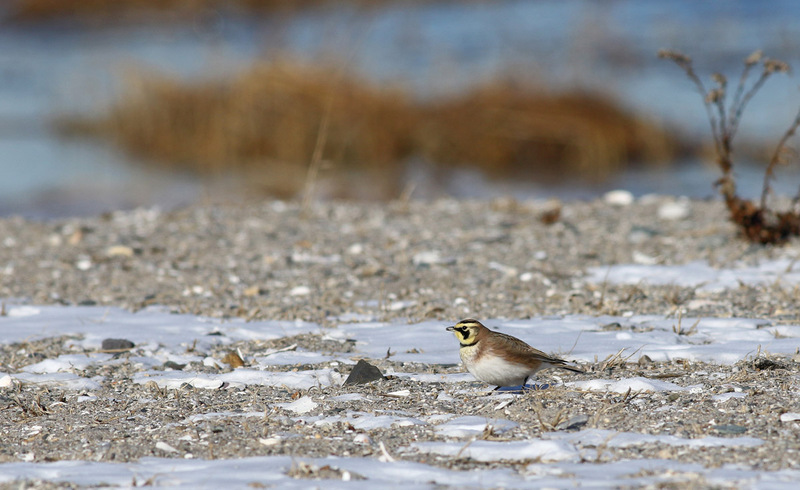 I continued down the beach and spotted a third bird, this one paler, buried in the marsh grass to the north. 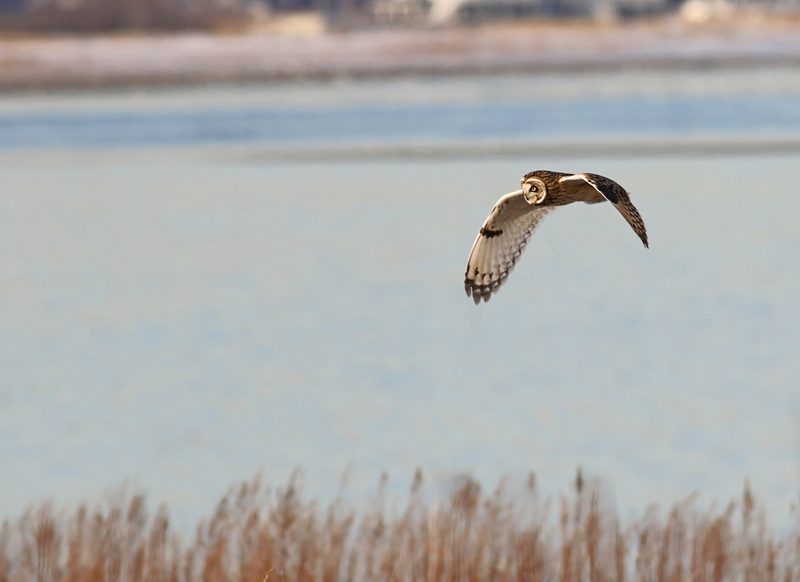 Continuing birding (there were plenty of gulls and waterfowl to sort through), I turned around a little while later to find that third owl flying right towards me. It landed at the water's edge on the marsh side of the barrier beach. I carefully belly-crawled through the weeds for several minutes to get in position for some photos. Luckily, the bird did not seem distracted by me and kept about its business. 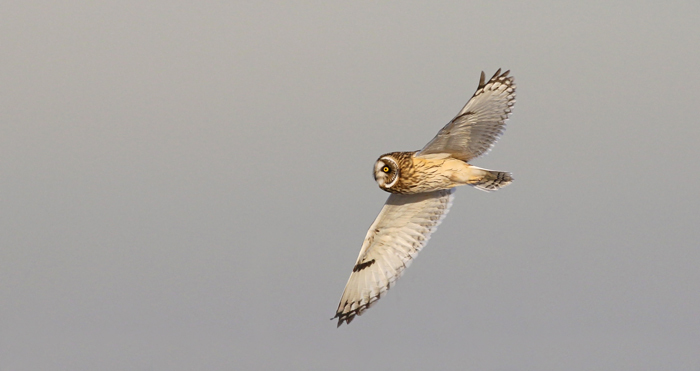 I must have laid there for a half hour just watching and photographing the bird, all to myself (a rare treat for this place, where owls are often approached aggressively by birders and photographers that don't have much practice in working birds). 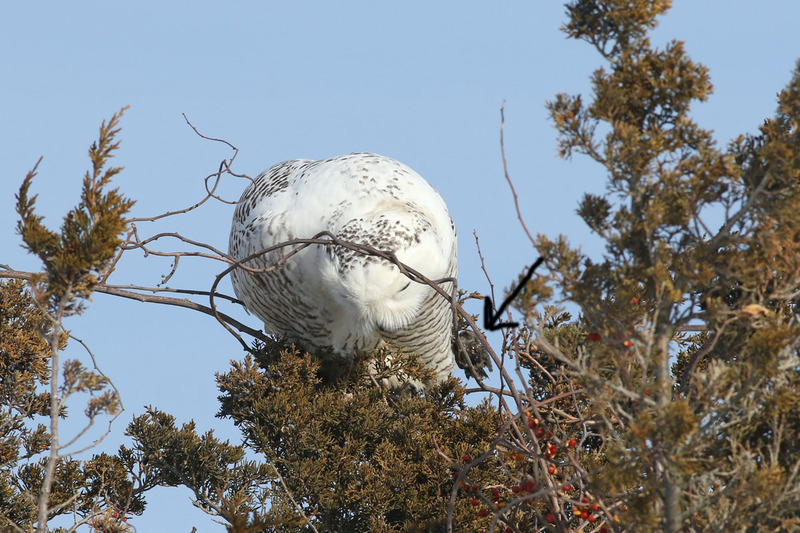 Always actively looking around, it eventually flew over my head and landed atop a cedar tree. 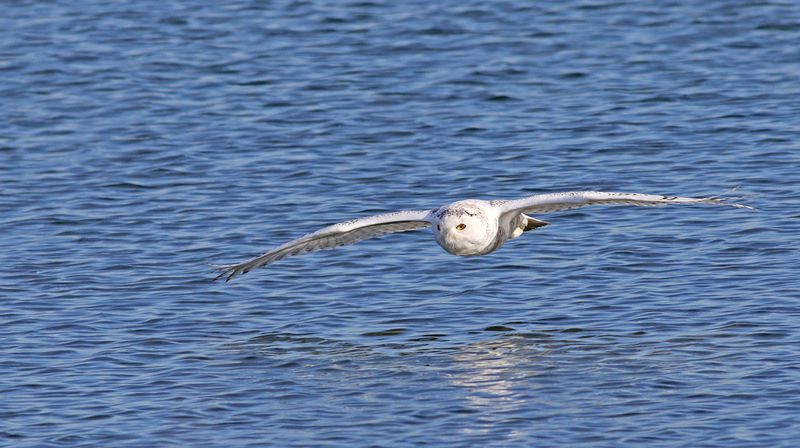 I repositioned myself and again watched the bird for quite a while. He (this appears to be a young male) hunched over uncomfortably and eventually coughed up a few pellets. 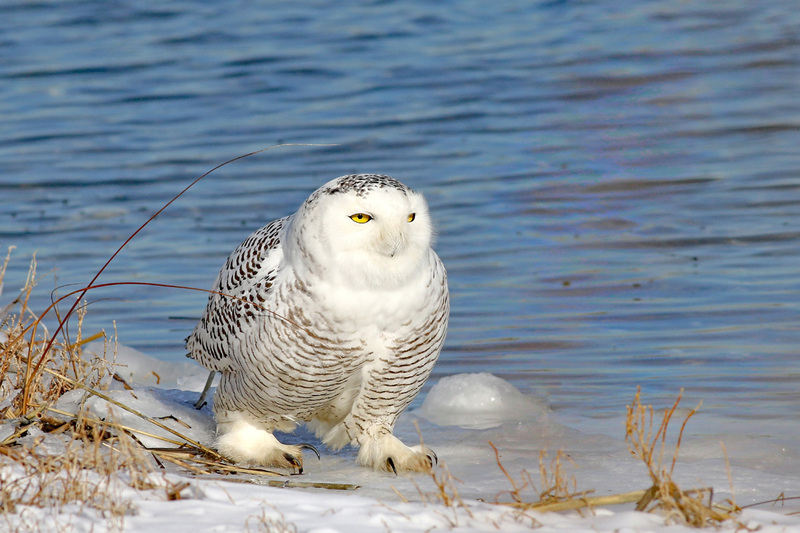 Soon after this, a few folks with cameras came charging down the beach path, and it was pretty clear that they were going to flush the owl...and they did. I checked the base of the tree for the pellets, but no joy. They must have gotten stuck in the thick veg towards the top. 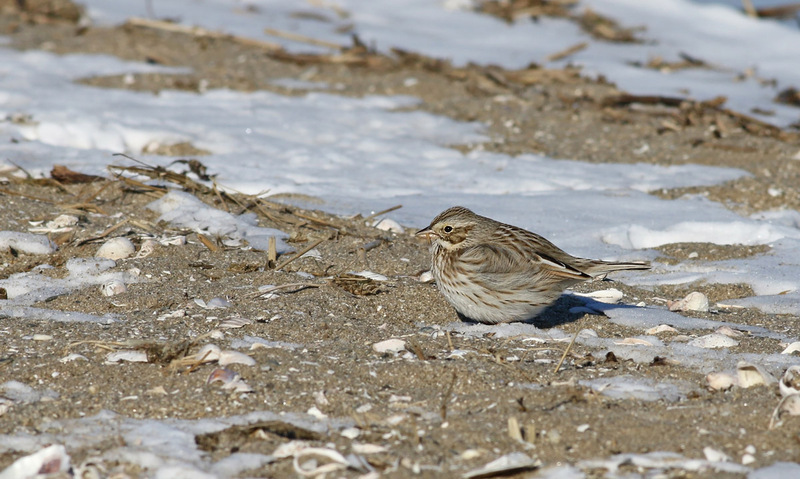 On the walk back to the car a couple HORNED LARKS and "IPSWICH" SAVANNAH SPARROWS showed themselves briefly. 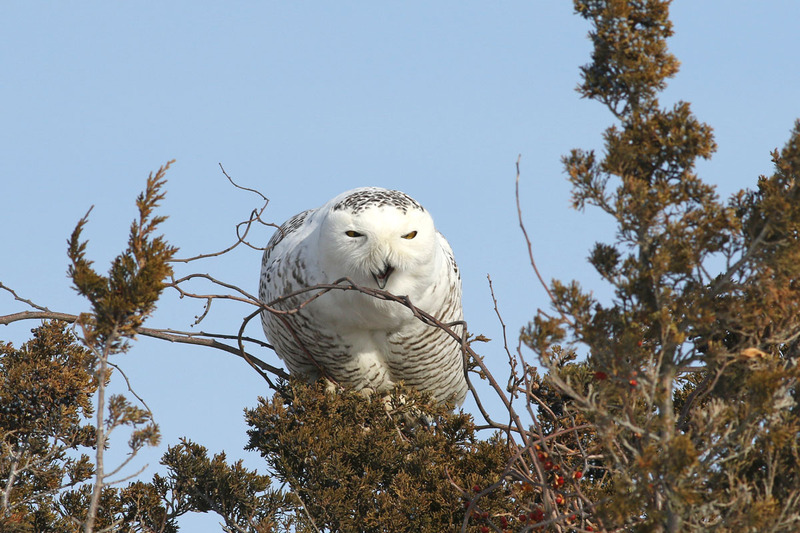 Next up was Stratford Point, a small property that has established itself as one of the premier birding spots in the state thanks to some quality habitat management by Audubon Connecticut. 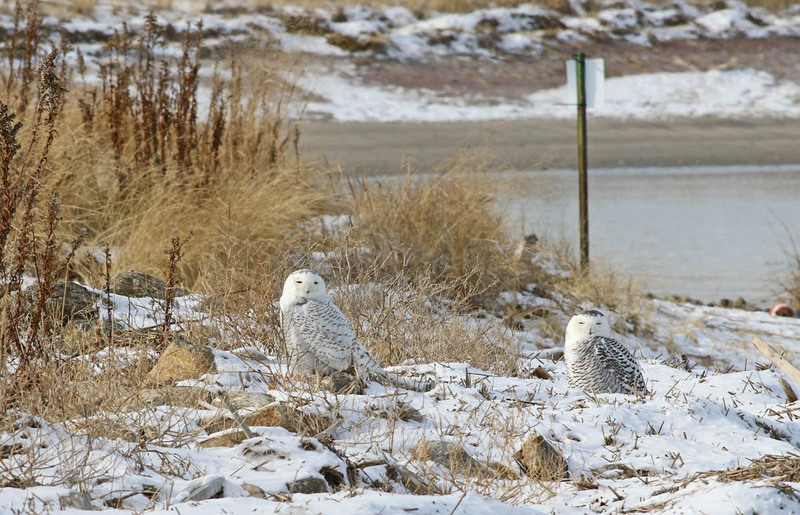 Stefan Martin had spotted not one, but two SNOWY OWLS sitting side-by-side. Buy one get one free! Always a crowd-pleaser. 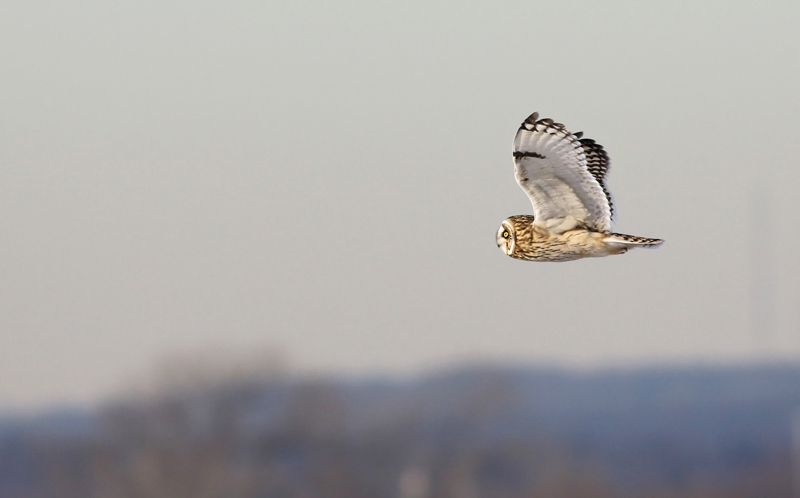 Later that afternoon, a SHORT-EARED OWL was hunting the grasslands at the point. It didn't take terribly long for it to catch a rodent, which it ate from a post in the middle of the largest field. The calm before today's intense nor'easter, yesterday was a rather serene and beautiful day to spend in the field. It was, after all, a balmy 25 degrees or so...the warmest temps all week! No Mistle Thrush for you,? Hi Brendan. Nope, haven't been bothered to make that drive yet. Probably won't get to, at this point. Cool bird though!